Mohamed Salah scored a hat-trick as Liverpool beat Bournemouth 4-0 to move top of the Premier League. 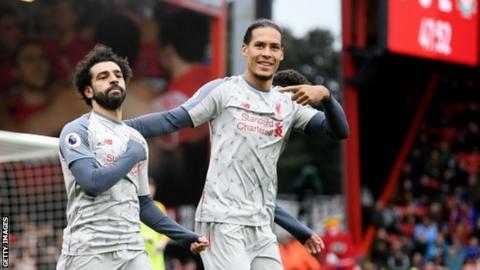 Liverpool triumphed in Saturday's early match to move above Manchester City, who lost 2-0 at Chelsea later in the day - their first league defeat of the season. Tottenham remain third after goals from Son Heung-min and Dele Alli gave them a 2-0 win at Leicester. Manchester United won 4-1 at home against Fulham thanks to goals from Ashley Young, Juan Mata, Romelu Lukaku and Marcus Rashford. It was United's first league win in five matches against a Cottagers side who remain bottom of the table. Arsenal left it late to beat Huddersfield 1-0, with Lucas Torreira scoring a 83rd-minute bicycle kick to take the Gunners third in the table. West Ham came from behind to beat Crystal Palace 3-2, with a spectacular strike from Felipe Anderson the pick of the goals. Ralph Hasenhuttl's first game as Southampton manager ended in defeat as they lost 1-0 at Cardiff. Burnley won for the first time since September with a 1-0 home victory over Brighton which lifted them out of the relegation zone. Scottish champions Celtic thrashed pre-match league leaders Kilmarnock 5-1 to return to the top of the Scottish Premiership. In the Championship, leaders Norwich scored a 93rd-minute winner against Bolton to stay top of the table. Second-placed Leeds kept pace with Norwich by coming from behind to beat Queens Park Rangers to stay a point behind. Frank Lampard's Derby are third in the table after beating 10-man Wigan 1-0.